Angelus recently won the title of Best French Brasserie in Zagat’s 2013 London Survey and deservedly so. 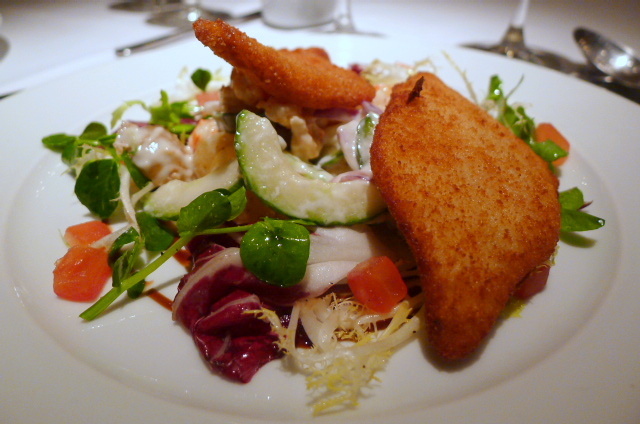 Last year I visited Angelus, a classic French brasserie on Bathurst Street near Lancaster Gate, to try their ‘small-bites’ pichounettes menu. I thoroughly enjoyed this menu for both its quality and the very reasonable price tag – I couldn’t believe you could get so much for so little. Pichounette options are still available on the Angelus menu, but this time I was there to try their à la carte menu. 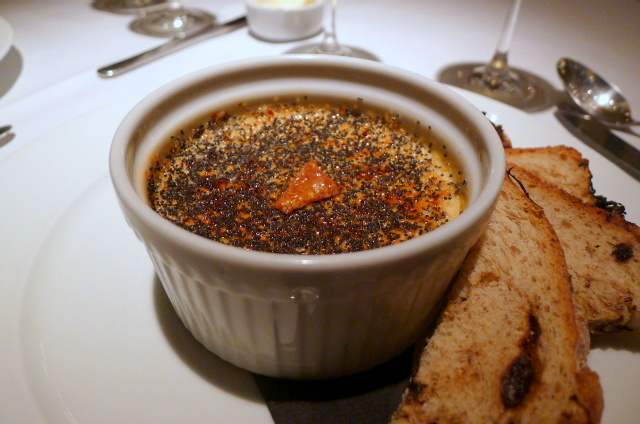 Foie gras crème brûlée (£15) was decadently rich and creamy, as well as being generously portioned. The caramelised topping of almonds and poppy seeds proved to be delicious as it provided crunchiness and sweetness, as well as character. Deep-fried fillet of plaice (£13) was served on a bed of warm potato salad with crayfish tails, cucumber and chives. The salad was satisfying and fresh, although the fish, being quite thin, was dry and could have therefore done with some acidity. It was also a little under seasoned. If you are looking for meat, then you will certainly get ‘meat’ with a huge main of grilled Glenbervie Estate rib-eye (£30) with green beans Lyonnaise, gratin potatoes on the side, and a shallot and red wine sauce. The steak was hearty and nicely cooked, and the potatoes were creamy. The sauce also packed a punch with a real depth of flavour. This was hearty, rustic French cooking. Lamb two ways (£27) including a three-layered pressed confit breast of Wells farm lamb had been cooked overnight and was very tender. 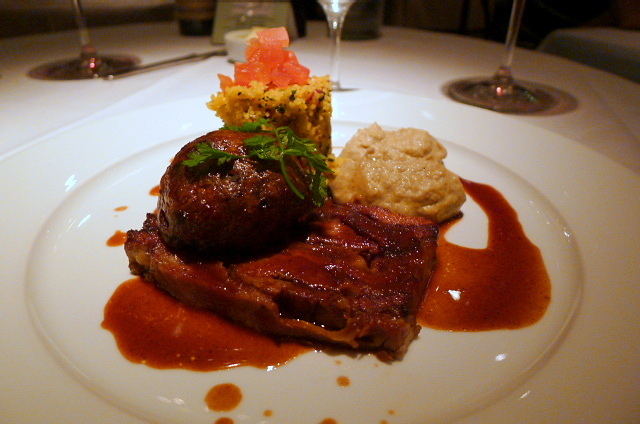 Also on the dish was lamb shoulder en crepinette, nicely spiced in a Moroccan style with cumin, coriander and cinnamon. To round off the Middle Eastern theme was an aubergine puree and a citrus and herb couscous. An assiette of desserts to share (£20) was lovely and reasonably priced considering the many number of elements included in it. There was a fantastic ginger and star anise crème brûlée with pineapple carpaccio and chilli caramel that contrasted well with the ginger and which added kick. A blueberry and almond financier was also delicious with a blueberry compote and a zingy frozen lemon curd. A hot chocolate fondant was gooey and warm in the middle and came with a fantastic caramelised banana and a yummy dulce de leche ice cream. Finally a strawberry, white wine and basil jelly was fresh and aromatic alongside a strawberry sorbet, nougat and black pepper tuile. 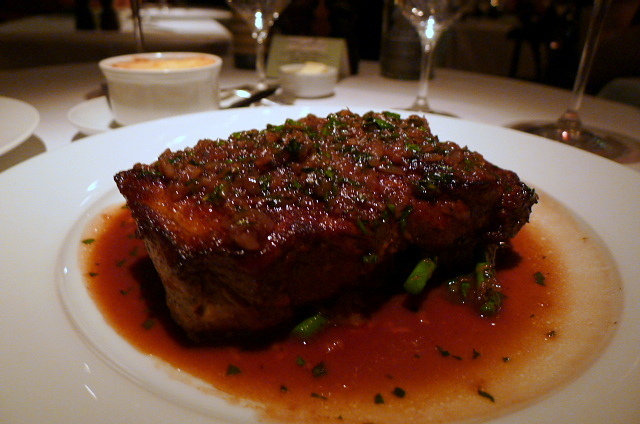 Angelus again impressed with its classic brasserie cooking. 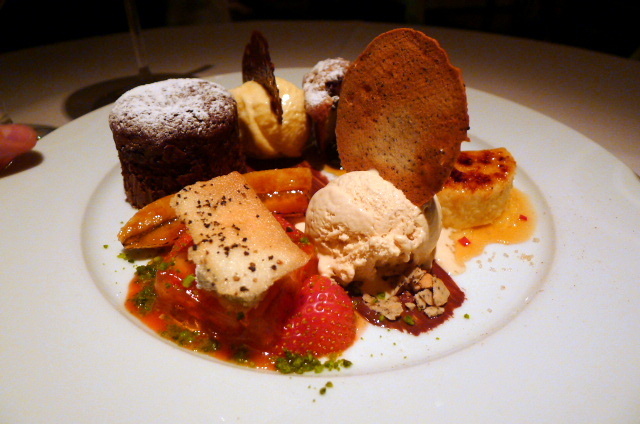 Moreover I found the assiette of dessert to be incredibly good value. Our maître d’ was also utterly charming. A nice little spot for some French good cooking. Price range: About £39 – £59 per head. Excludes drinks and service.